During the summer long Ami-Along I am interviewing some of the other amigurumi designers involved in the C/KAL. Last week we met Melissa of Melissa’s Crochet Designs, and before that we learned about Mevlinn of MevvSan. Today, I am happy to introduce to you Alyssa of Monster’s Toy Box! You can find her designs on her website and Ravelry. Hope you enjoy learning all about her and her design process. Alyssa: I am a college student who is currently studying computer science— I am very interesting in the programming aspect of it, though currently I am much better at crocheting than coding! My first experience with needle arts was learning how to loom knit when I was 15 or so. Every year after that I’ve fallen a little bit deeper down the crafting rabbit hole. I both knit and crochet and I have even dabbled with spinning and dyeing my own yarn (Still, I always end up going back to crochet and amigurumi—I’m obsessed). 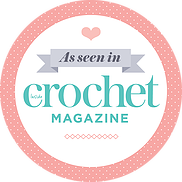 Alyssa: I started designing in 2010 or so, shortly after learning how to crochet. I didn’t want to make scarves or blankets and amigurumi looked like a lot of fun. This was before I had discovered Ravelry and couldn’t find a lot of amigurumi patterns that I liked, so I came up with my own! My first ever design was Giddy-Up the Horse, but it wasn’t until 2013 that I actually started publishing my patterns to Ravelry; appropriately, I picked Giddy-Up (who had received a number of make-overs over the years) to be my first published pattern. During those early days of learning how to crochet and design, I actually thought it would be really cool to be able to publish my own patterns, but wrote it off as “That’s silly. That will never happen!” Thanks to a lot of support from my Ravelry friends, it did happen… I am so grateful for them, because it has been an absolute blast! Alyssa: Picking out what I want to design is a combination of deciding from a list of ideas I keep written down (I often ask members of my Ravelry Group what sort of things they would like to see me design) and just going with whatever crazy thing pops into my head. I love the exaggerated proportions seen in the Japanese kawaii aesthetic (like Hello Kitty) and in some children’s toys. I’ve taken that and tried to put my own spin on it. My animals tend to have a very cartoonish, pudgy look to them. For specific designs, the inspiration can come from anywhere. My Ravelry group, friends, and family all give fantastic ideas. Wikipedia articles, documentaries and even videos games can be great sources as well; if I am interested in something, it gives me that extra push to try to create a design for it. For finding interesting shapes to use, I like to look at nature and even architecture. To give one weird example: the shape for my Munchie Monster was inspired by a building I drove past in downtown Nashville! Alyssa: There is quite a bit of pre-planning in my design process. I usually have several different ideas about how to make something and so I sketch it out to help me piece together all the different parts. Although my critters are far from realistic, referencing photos of their real life counterparts is really helpful at this stage. From the sketch, I make notes about what sort of shaping to do: where to increase or decrease, how many stitches around it needs to be at a certain point, whether there are any “problem” spots where I need to experiment with different techniques to get the right shape, and so on. My favorite part of designing amigurumi is coming up with new shapes and improving upon things I’ve done in the past, so I do a lot of experimenting. Sometimes I nail the design on the first try, sometime I have to rip things out and start again (I’m currently working on a locomotive design… I think the only parts I haven’t frogged and redone ten times are the wheels!). Alyssa: Because I have a hard time with crocheting through both loops. I suffered from some sort of Repetitive Stress Injury in my wrist sometime after I started crocheting. Because most amigurumi are made with tight stitches and small hooks, it can put a lot of stress on your hands, which really aggravated the problem. I could only work on a few rounds of amigurumi before it started to hurt. I had read that BLO was supposed to be less stressful on your joints, so I tried out some patterns done in BLO… and it worked! No wrist pain! On a less practical level, I think that amigurumi done in BLO have a very distinctive look that I absolutely love (The easy sewing is a plus, too)! Alyssa: That’s a really hard question… can I pick more than one? I really love the Snack-Sized Softies series; I love crocheted food, things done in miniature, and anthropomorphic inanimate objects. The Snacks combine all of those in a tasty, palm-sized package. Plus I love the challenge of trying to capture the details of the different foods in a few stitches as possible (Most of the Snacks are only 30 stitches around). Alyssa: Giddy-Up the Horse, my first published pattern, is also my most popular pattern by far. Even though he was released over three years ago now, I still get plenty of new people downloading his pattern every month. Alyssa: The Munchie Monster! He started out as this really silly idea I had, “Hey, why not make a monster with a tummy you can stick stuff inside?” I wasn’t expecting really expecting the idea to take off like it did— both the full-sized Munchie and his Mini counterpart are some of my best-selling patterns. Me: What is most challenging for you as a designer and creative business owner? Alyssa: For me, it is trying to strike a balance between all of the different aspects of running a business and real life. Monster’s Toy Box versus school and homework is a big one, especially during that “crunch time” leading up to final exams. Let’s face it—I’d rather be crocheting than studying! Another big thing is “designer’s block”. I go through periods where I have so many new ideas that my hook can’t keep up, but then there are times where my inspiration gets completely sucked dry—I can’t come up with anything new and if I try to crochet a prototype, it never turns out the way I want it to. The best thing to do is to ride it out and not force it… it’s good to take a break and work on some other things for a while. The designing itch usually comes back within a few weeks. Alyssa: You don’t know until you try! That first step into the world of pattern-designing can be really intimidating, but don’t let that stop you. Perhaps the most important thing is to make sure your pattern is well laid-out, well-explained and error-free; enlist a couple of people to help you with pattern testing and proof-reading and be open to their suggestions on ways that you can improve the formatting of your pattern. Alyssa: Get to know all of your basic stitches and techniques (single crochet, double crochet, half-double crochet, increasing, decreasing, etc), because if you know how to do these, you can make almost any amigurumi you want. Even the “fancy” stitches you might run into are usually based on these simple stitches. Alyssa: I am very active on Ravelry; you can usually find me hanging out at the Monster’s Toy Box Ravelry group. That is probably the best place to go to keep up with what’s going on in the Toy Box and what crazy things I’m cooking up next. I am also on Twitter (@MonstersToyBox) and I have a website, www.monsterstoybox.com, which is currently on hiatus due to some real life stuff. I plan on getting back to blogging soon, though. Thank you Alyssa for sharing your story with us! If you decide to make some amis using Alyssa’s patterns, make sure you enter them into the Ami-Along for your chance to win prizes! It will be running until the end of August 2016.